The University has a long association with Hong Kong being one of the largest groups of alumni with almost 4000 alumni registered with the Alumni Association. You are part of a successful group of former Sunderland students who have gone on into successful careers in engineering, business, pharma, teaching and design. The University opened the Hong Kong campus in 2017, providing spaces for 1,000 students to attain a globally recognised degree from a UK university, right in the heart of Central, Hong Kong. The University also awards degrees working with Hong Kong based partners at Hong Kong College of Technology, RDI Management Learning and the University of Hong Kong School of Professional and Continuing Education. 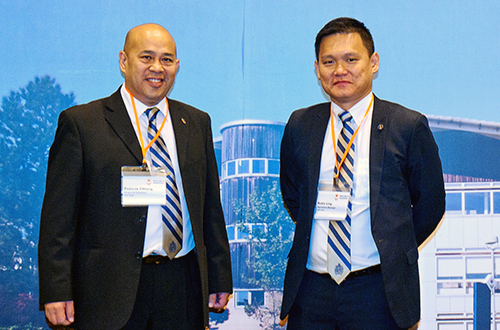 Francis Chiang and Robin Ling look after the University's China and Hong Kong Office. They are passionate about the University of Sunderland and work with the Development and Alumni Office on supporting our alumni following graduation. A number of successful networking events have been hosted. Please, update your details through the Alumni Association to keep informed of upcoming activities in China and Hong Kong.